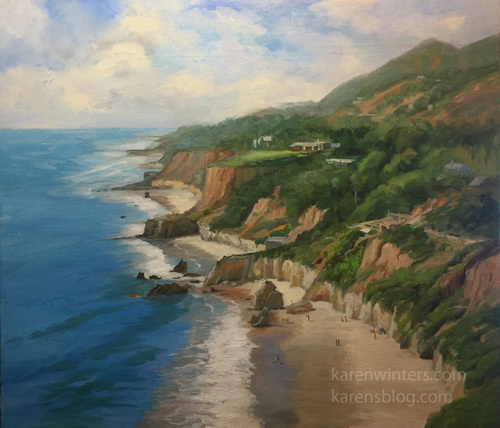 This is a hillside view of beautiful El Matador Beach (3 coves, actually) on Malibu’s luxurious coastline. The villas and playgrounds of the locals settle comfortably into the lush landscape. Below, you can see the large formation of “the bull” which gives El Matador its name. See more of my paintings on my website. 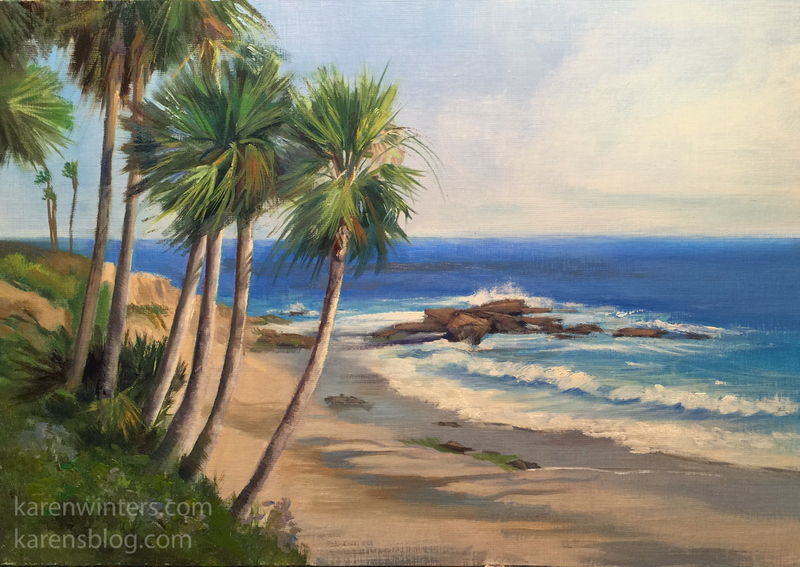 This plein air style painting was fun to paint, capturing the breezy, easy warmth and salt spray of Laguna Beach, California. Marine paintings and seascapes always take me to a happy place. 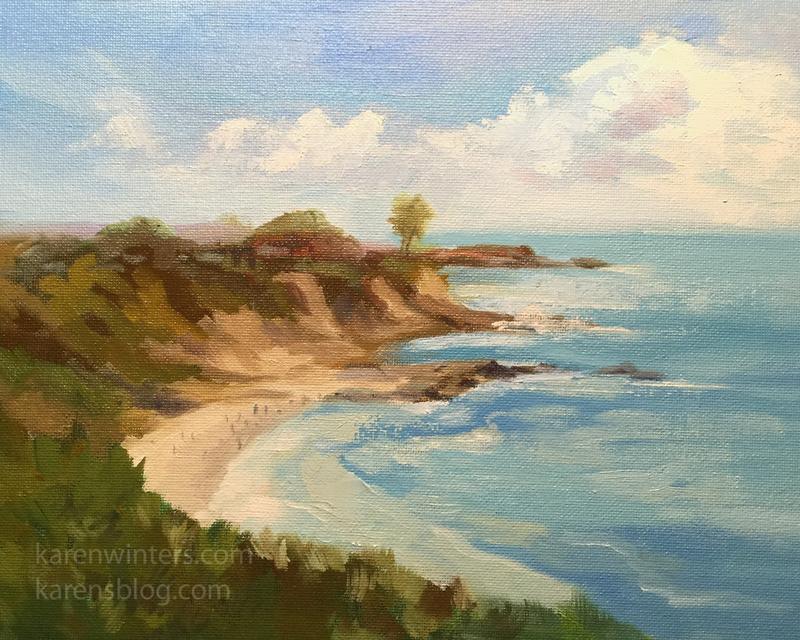 This new painting features one of my favorite ocean scenes – Carmel Bay on the Monterey Peninsula. This viewpoint is looking southward across the bay toward Monastery Beach. The Carmel River enters the bay on the left. I’m not sure what kind of rocks these are – they seem harder than sandstone or I think they’d be more worn away … but they are certainly rounded into interesting shapes via wave action. There’s something about them that reminds me of Henry Moore sculptures. The warm summer sunshine attracts thousands of beach-goers to Little Corona Del Mar beach. 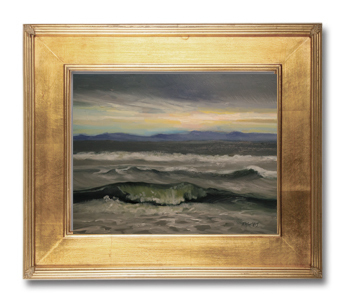 It’s a great place to enjoy the Newport surf. 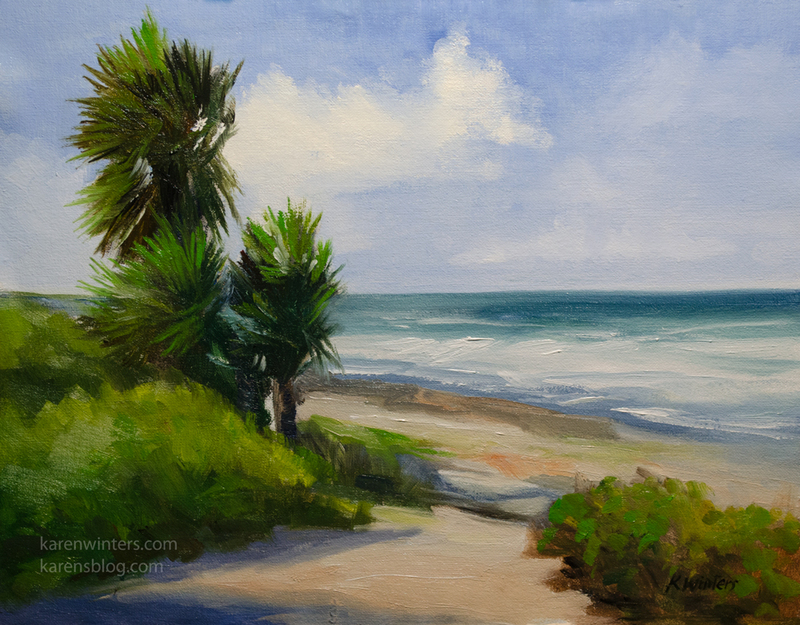 With the hot weather we’ve been having, painting this was a cool refreshing treat. The location for this is along the La Jolla, California, shore, a little bit south of the main city. 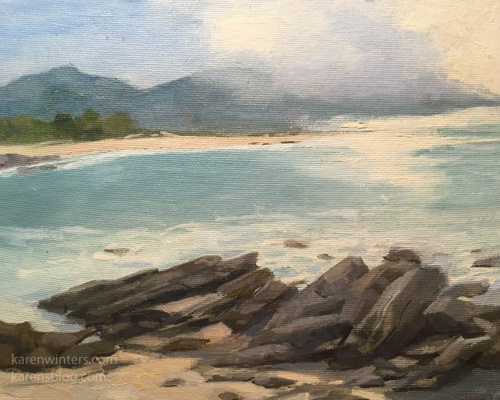 For price and more info about this painting, please write. 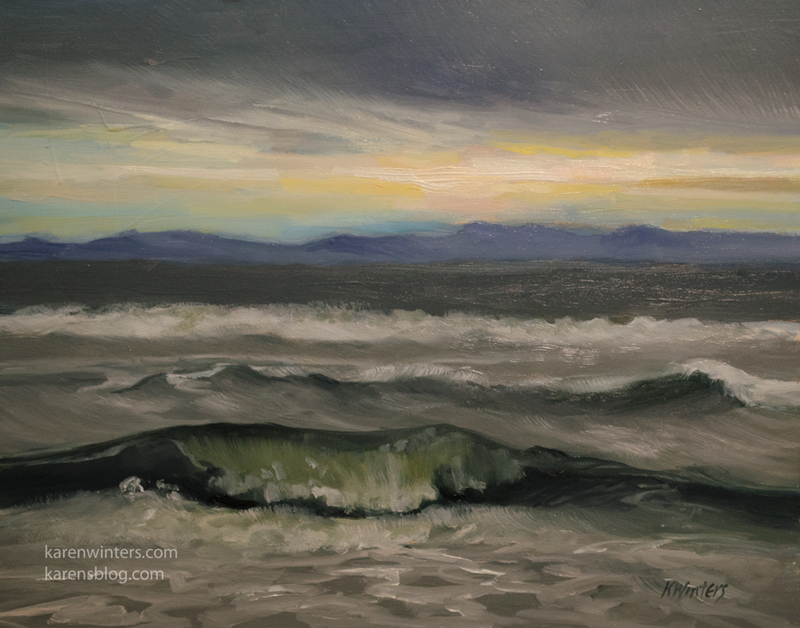 When stormy weather churns up the ocean, the results can be dramatic, and the sunsets are glorious. This is a view of Huntington Beach, with Catalina, cloud-shrouded, on the horizon. Last night I had the pleasure of seeing Timothy Clark paint a demonstration watercolor for a local art club. Since Timothy doesn’t demo publicly, only for his own workshops, this was a rare treat. What made the evening even more special was when one of my watercolor portraits got the blue ribbon for Artist of the Month, which puts me in the running for artist of the year. The perfect ending to a perfect day, even if it was dark and rainy.